Upon receipt of your recipient list, we verify all addresses with the USPS. We then give you one opportunity to correct any addresses they determine to be undeliverable. Next, we provide a PDF proof that shows address and postage layout and location. Upon proof approval, we produce the order, printing your recipient addresses directly on the package. We then affix appropriate postage* and seal the package to make it ready for mailing. Finally, we deliver your order to our local Post Office OR we bulk-ship the items directly to you so you can do the final mailing. please note that postage must be pre-paid before production begins. All packaging options are approved for mailing. What Products/Packages can I mail? All of our products and packaging have been approved for Direct Mail. If you are trying to determine the right package for the product you wish to send, please contact Customer Service. Can I change or add recipients to my mailing list? You can change, add, or delete recipients without charge until proof approval. Changes made AFTER proof approval will incur a fee. Can I mail to locations outside the US? The Mail It service fee includes mailing to any country that can be serviced by the USPS. We may include customs or other regulatory information as part of the postage imprint. Postage rates vary by country (please call for a quote). Also, please understand that we or the USPS cannot verify delivery to many countries as the local postal carriers control the final delivery of items. Can I personalize other areas of the package? Direct Mail service includes the address area ONLY. For additional fees, you may personalize other parts of the package (in fact, we have some pretty cool options); please refer to our Personalization page for more details. What if I want to do my own mailing? We can leave a blank area on the package for your own address labels and postage and bulk-ship items to you. There is no additional charge for this; it is included in your normal art setup fee. Return address can be included in artwork. We can handle all of the steps above except delivery to the Post Office. 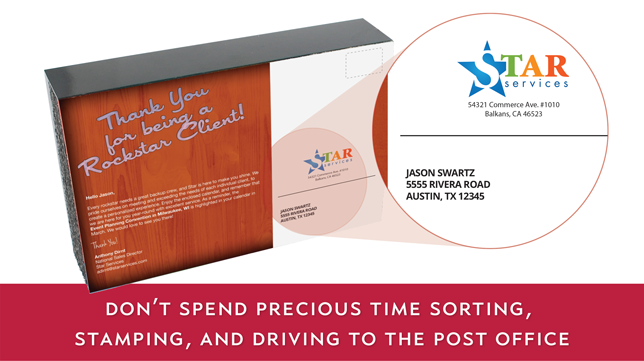 We will bulk-ship the packaged products to you with your recipient addresses already printed. This incurs the normal Direct Mail service fee since we are still providing all of the services above and handling the bulk shipment. Why were my addresses marked wrong by the verification system? Many things can cause this: misspellings, transposed digits in zip codes, missing information (such as suite numbers), incorrect road names (i.e. Street, Avenue, Road, Circle, etc. ), or alternate names (CR 530 vs. RR 530, a named road vs. a numbered road, etc.). We use an advanced system that attempts to correct as many of these issues as possible, but there are times when it cannot. We encourage you to closely check any addresses returned as unverified. I know my addresses are correct, but your verification system says they are wrong. Will they still deliver? If the issue with the address is relatively minor (see issues above), then most likely, yes. Postal carriers are often able to determine the correct destination since they know their routes well and will attempt delivery. That said, we cannot guarantee packages will deliver to unverified addresses. Do I really need to include a return address? Yes. It is required for many of the postal classes we use for mailing. Also, it helps ensure you will receive any returned mail that could not be delivered to its intended address. USPS tracking may be available as an option. Contact Customer Service for details. Can you guarantee delivery of my items? Unfortunately, no. We will hand off your items to the post office in a format that is ready for mailing. Once given to the USPS, we have no control over final delivery and cannot be held responsible for items that the USPS fails to deliver. Any tracking or delivery confirmation services included in your postage are provided directly by the USPS and any issues with delivery must be resolved with them. Why must I prepay the postage cost? We are purchasing the postage from the USPS on your behalf. We must have postage secured before we produce the order as postage is applied during production. Do you make a profit on the postage cost? No. We are passing the cost of postage directly from the USPS to you. We do not mark it up or increase the price.